Pear Dumplings Cobbler, a simple and delicious recipe of juicy pears cooked to perfection in a sweet buttery sauce between two layers of dumpling dough. Makes a gorgeous presentation for an elegant dinner. 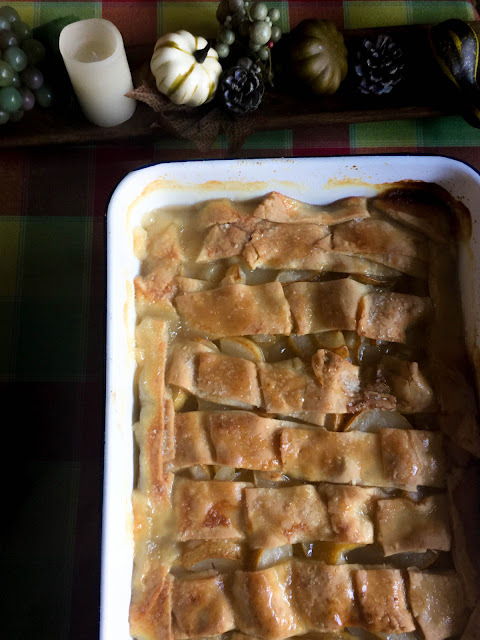 Dumplings cobblers is a favorite around our house, and this Pear Dumplings Cobbler is a must around this time of the year. 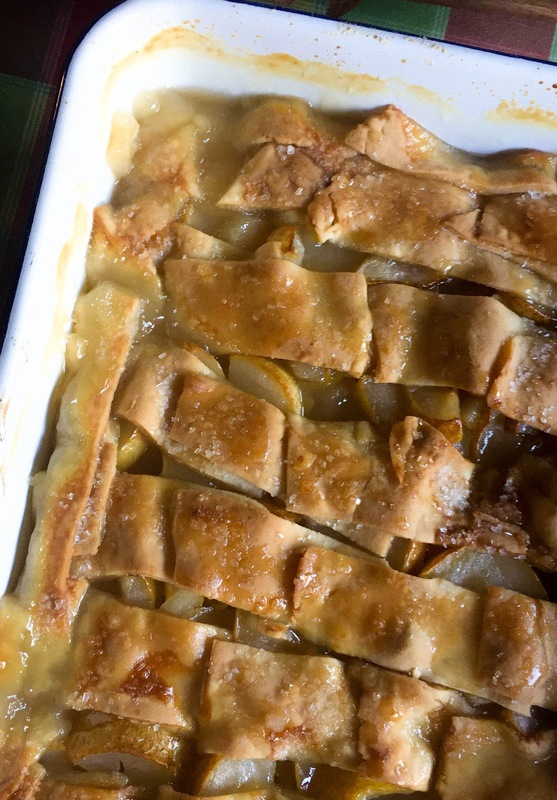 The simplest of ingredients are used in the Pear Dumplings Cobbler, pie dough, pears, sugar, and butter. That's right only four ingredients. 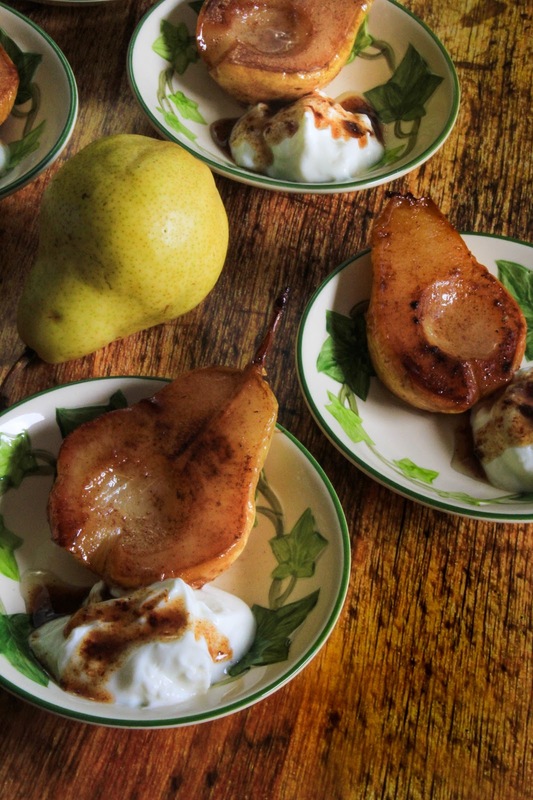 The pears are the star in this recipe. 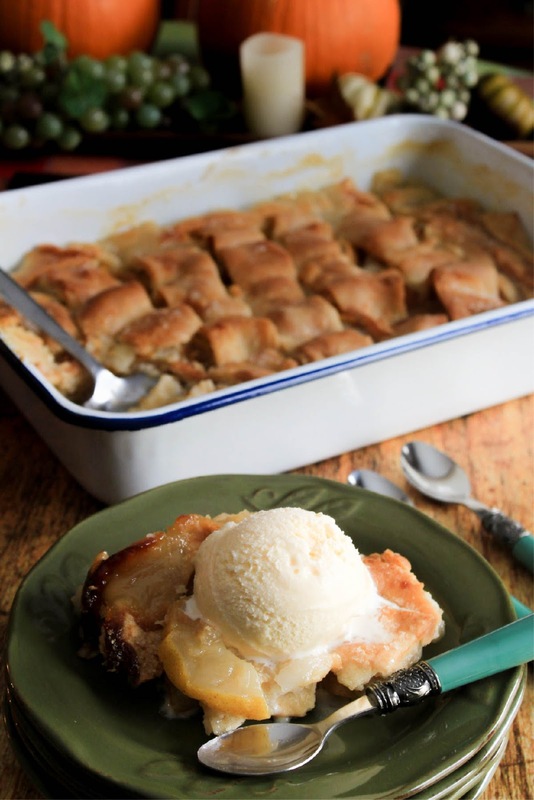 Pear Dumplings Cobbler is a cozy dessert to serve a crowd. 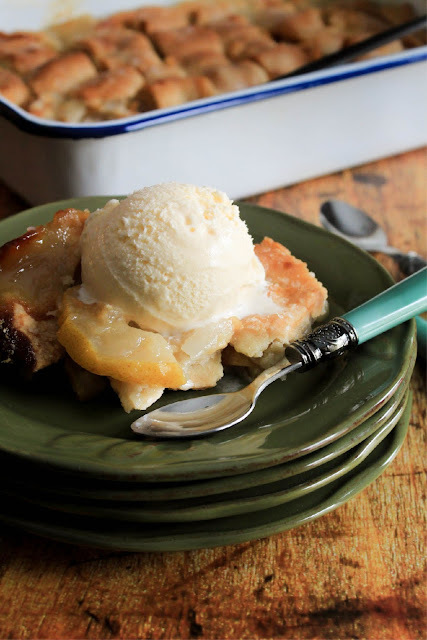 It can be made ahead of time and ready to serve plain or with a scoop of ice cream. A cobbler is made with fruit in the bottom of the baking dish and a biscuit dough or pie crust placed on top of the fruit. When cooked the fruit releases the juice in them and mingles with the top crust. The cobbler will be runny. A dumpling cobbler is made with a pie crust layer on the bottom of the dish, fruit placed on top of the crust, and then another crust placed over the fruit. 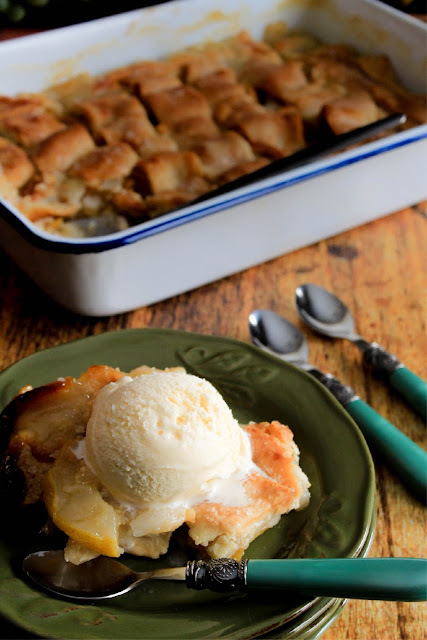 A solution of water, sugar, and butter poured over the entire cobbler. When cooked this forms a dumpling texture with the bottom and upper crust. The cobbler will be thick and creamy with dumplings. I chose not to peel the pears. They are thin and have an incredible flavor of the pear. If you prefer, you may peel them. Slice pears in a large bowl and toss with fruit fresh; set aside. Mix flour, salt, shortening, and cold butter together with a pastry blender until well blended. Add water to the well blended flour mixture. Mix all ingredients together with a fork until come together in a ball slightly. Divide the dough in half. Roll one half of the dough on a lightly floured surface with a rolling pin and place into a large oblong dish push the dough up the sides. In a large saucepan, heat, sugar, butter, and water over medium heat until butter melts. Pour over the pears in the prepared dish. Roll the other half of the dough on a lightly floured surface and cut 1/2 inch strips and place a row going lengthwise 1/2 inch apart on top of the pears. Place another row of strips going the opposite direction horizontally 1/2 inch apart. Brush liberally with melted butter and sprinkle with coarse sugar and bake for 1 hour. The Pear Dumplings Cobbler not only can be made ahead of time it is very freezer friendly. Prepare the cobbler except for pouring the hot solution of butter and sugar over the cobbler. 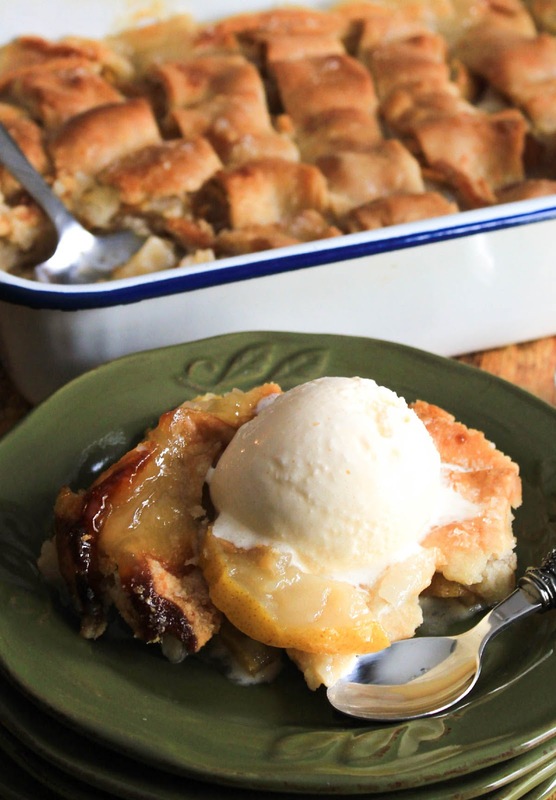 When you take the cobbler out of the freeze, prepare the buttery solution and pour over the cobbler and bake. 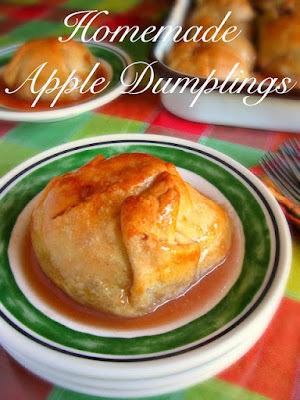 I hope you will get to make the Pear Dumplings Cobbler soon. A simple and delicious recipe of juicy pears cooked to perfection in a sweet buttery sauce between two layers of dumpling dough. Makes a gorgeous presentation for an elegant dinner. In a large saucepan heat, sugar, butter, and water over medium heat until butter melts. Pour over the pears in the prepared dish. Roll the other half of the dough on a lightly floured surface and cut 1/2 inch strips and place a row going lengthwise 1/2 inch apart on top of the pears. Place another row of strips going horizontally the opposite direction 1/2 inch apart. The top crust may be rolled out in one single crust and placed over the top of the pears. Cut slits in the top to vent the hot steam. Looks so good.....perfect for holiday dessert. One question - how much fruit fresh is needed? Sorry about that...I just added the amount. Thank you for stopping! That looks fantastic! Thanks for sharing at Home Sweet Home!